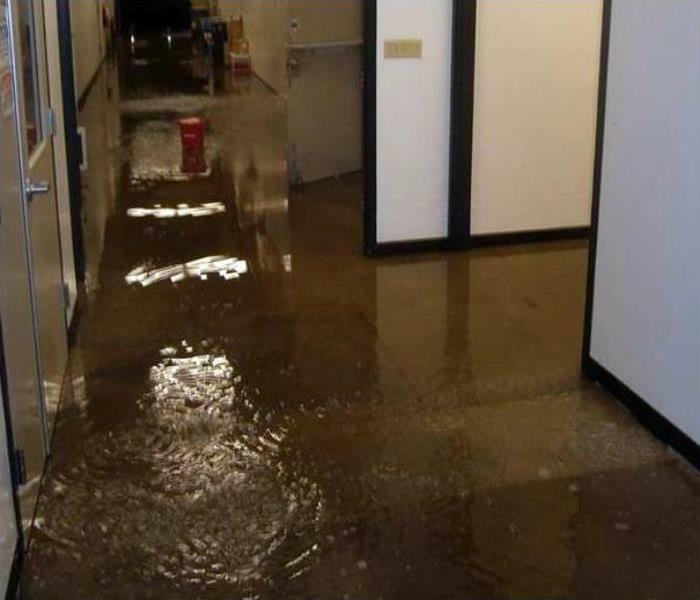 Call us when your Phoenix commercial property experiences a water damage disaster. We are standing by 24/7. We are IICRC in water restoration. 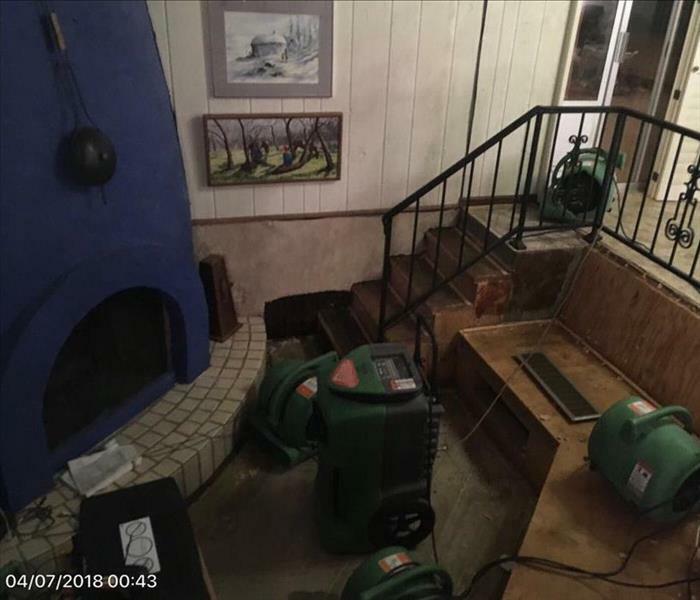 SERVPRO of Central Phoenix has the training, water damage experience, and specialized equipment to restore your home in Phoenix to pre-damage condition. 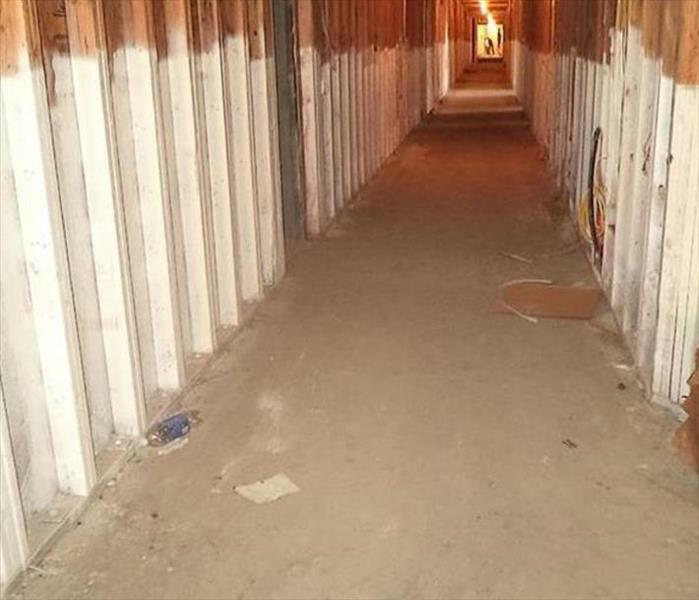 Rapid black water intrusion calls for the removal of the contaminated water, the demolition of non-salvageable drywall at the flood cut level, and more. 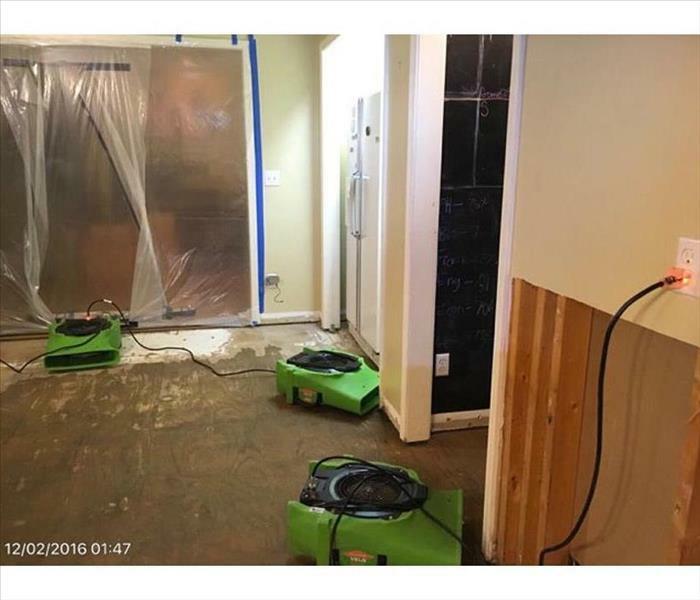 SERVPRO techs can dry out the wet surfaces and air and disinfect to ensure that a clean and safe environment has been restored prior to rebuilding the rooms. 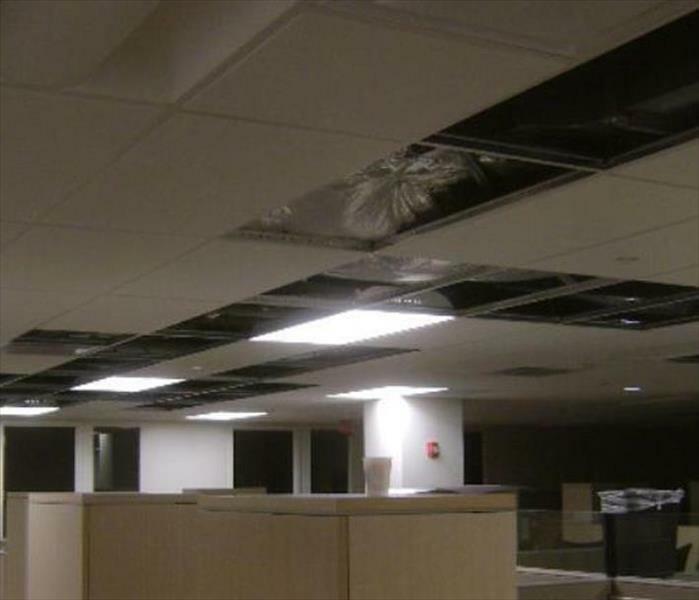 The leak in the roof soaked some acoustical ceiling tiles in this Central City Phoenix office complex resulting in a water loss. 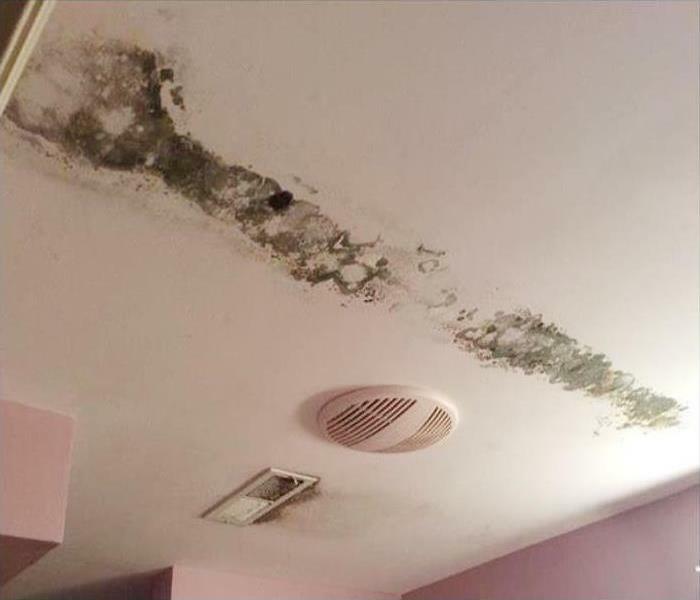 SERVPRO can remove and discard the easily replaceable tiles and dry out the void to prevent mold growth and bad odors. 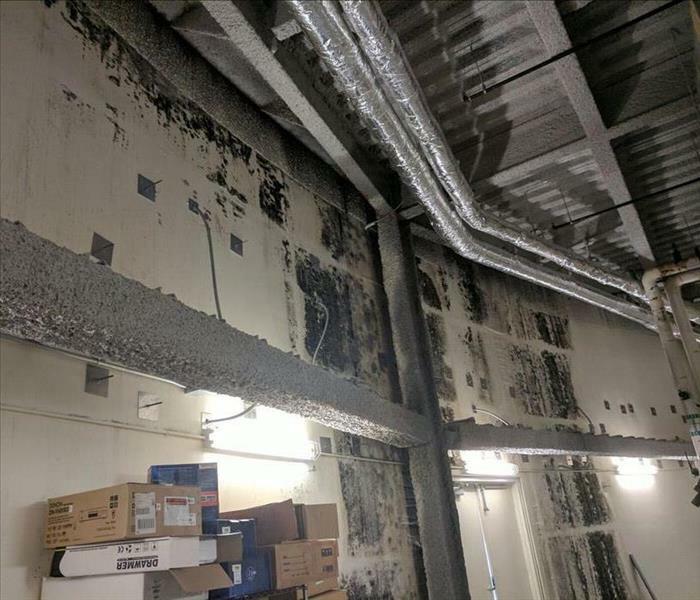 Storm damage to this Phoenix manufacturing plant created a lot of water damage. The water damage cleanup project would require commercial water extraction equipment and a large quantity of drying equipment. SERVPRO of Central Phoenix maintains an extensive inventory of water damage restoration equipment. We would be able to respond to our client's storm damage quickly and bring the resources necessary to do the job. 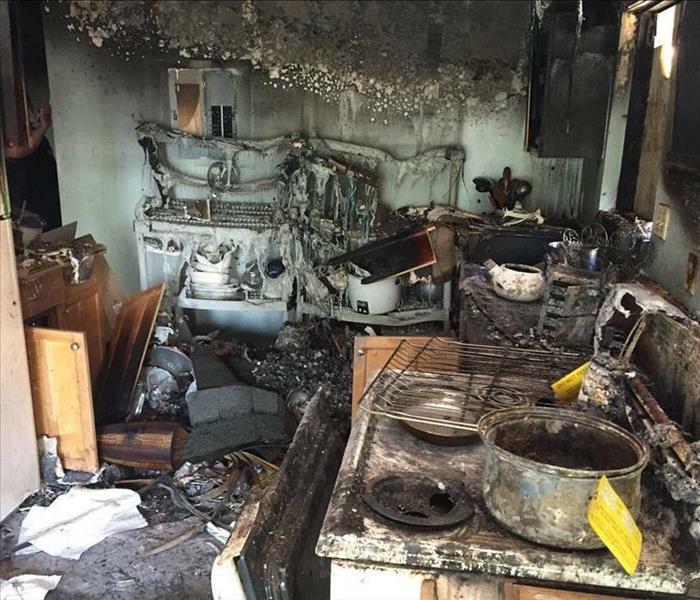 The fire extinguishing efforts left a damaging water event in this Phoenix-area home. The SERVPRO team has already removed the custom carpeting and upholstery to dry out the underlying concrete deck and seating supports. Our equipment is working hard, and our customer was very pleased with our service. 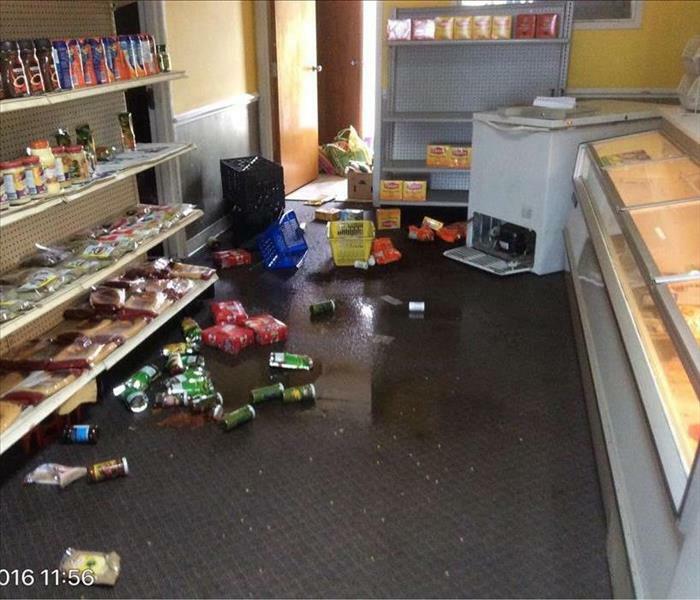 The storm swept through the backroom and continued with strong winds to deposit water and food products on the floor. Central Phoenix city businesses often rely upon SERVPRO to clean up and restore the retail shop swiftly to once again allow for customer foot traffic. A flood can cause significant damage to your home. We are available 24/7, locally owned and operated, and Faster to Any Size Disaster. Our team of storm damage specialists has the training, expertise, and advanced equipment to restore your home to pre-damage condition. Mold damage developed in this Phoenix bathroom due to a supply line to the toilet developing a leak inside the wall. The leak obviously had existed for several weeks before it was discovered. SERVPRO of Central Phoenix could dry the interior of the walls and clean up the mold. 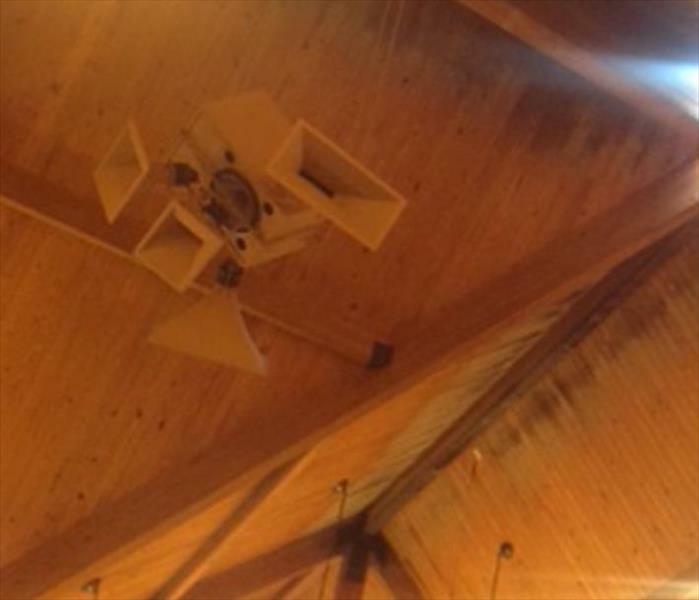 When mold stains show up in the finished wood ceiling of a church in the Phoenix area, professional mold remediation is needed for a safe and neat cleanup and disinfecting. Count on SERVPRO to arrive with the lifts and equipment necessary for such an undertaking. Water damage at this Phoenix home soaked the carpeting in the pictured room. Swift action by the property owner led to a fast and efficient water extraction. When the water damage is extracted from carpeting quickly, it prevents the subflooring from absorbing too much moisture content. So time is as the saying goes, "truly of the essence" when it comes to water damage of this nature. 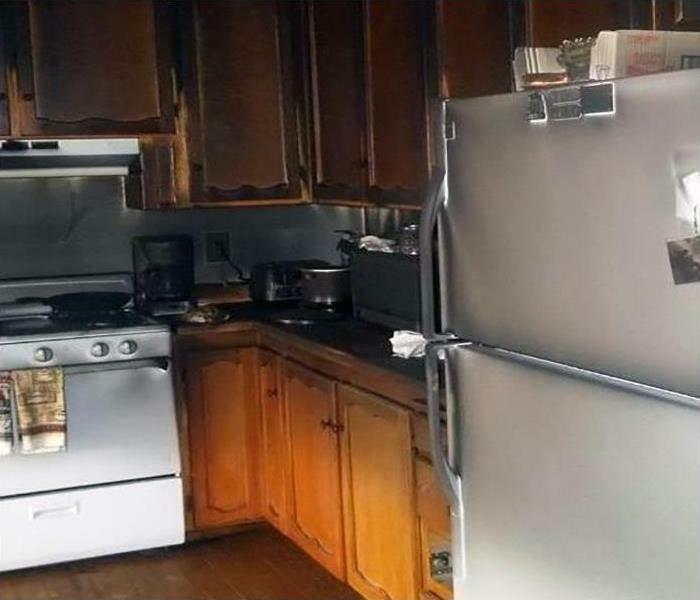 It is amazing how quickly a grease fire can get out of control in a Phoenix kitchen when a handy extinguisher isn't so handy. 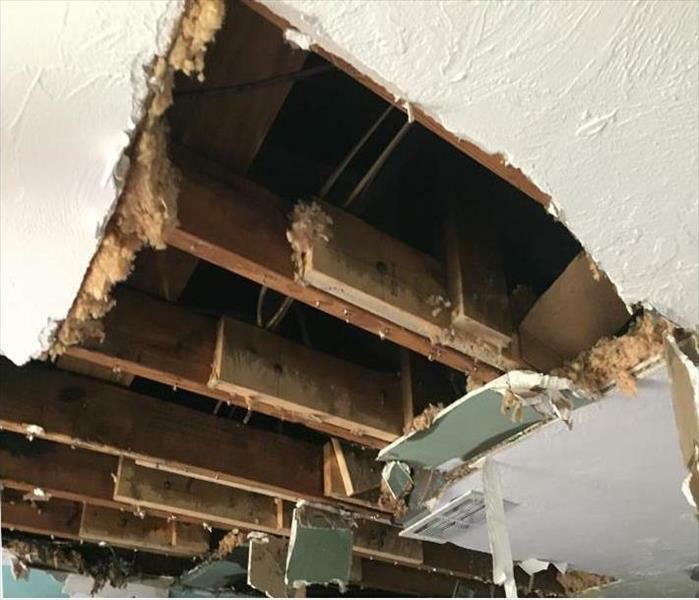 This home needs a demolition of all damaged building materials, appliances, and fixtures--something that the crew at SERVPRO can do even as they start the odor abatement process. Call on reliable, well-trained technicians to get it done right. When a flooding disaster occurs, the team at SERVPRO is the best choice. We are the best in the industry, available 24/7, and are IICRC certified. Our staff has the equipment and storm damage experience to return your home to pre-damage condition. We’re Faster to Any Size Disaster! 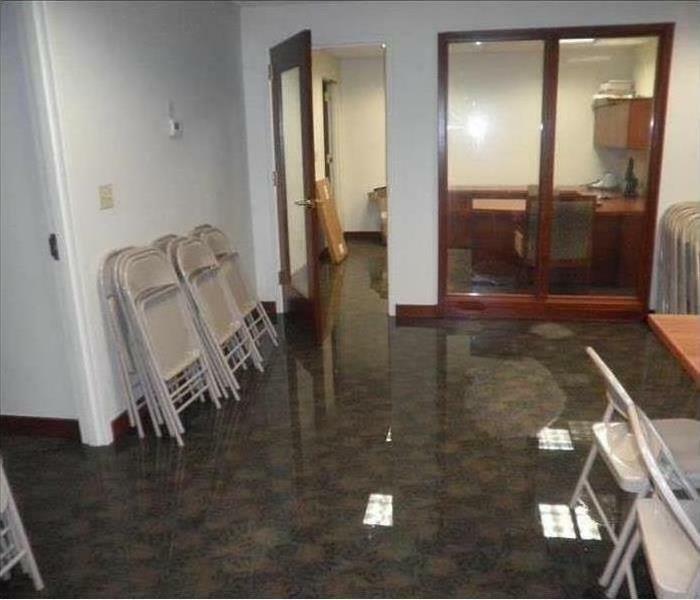 Commercial water damage at this Phoenix office occurred when a water supply line broke over a weekend. The commercial grade carpeting was covered with standing water. 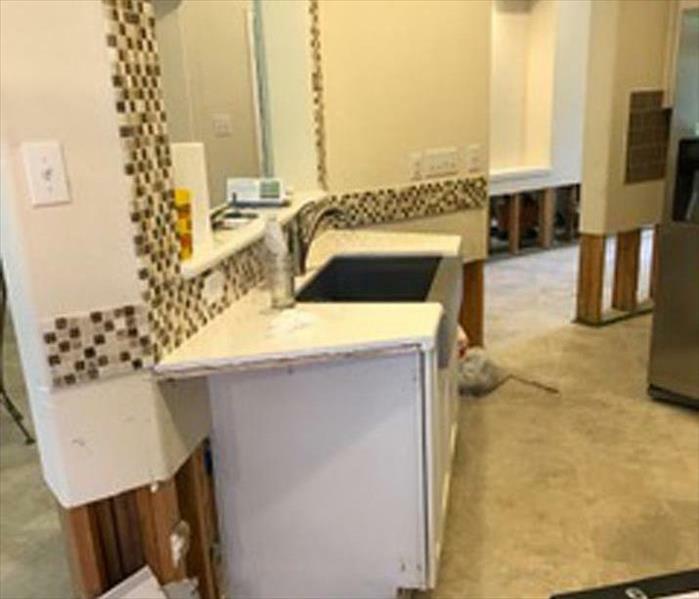 SERVPRO of Central Phoenix technicians would provide the property owners with a complete assessment of the damages and then start the water cleanup project. After suctioning up the water, our technicians would set up commercial air movers and dehumidifiers to aid in the drying process. 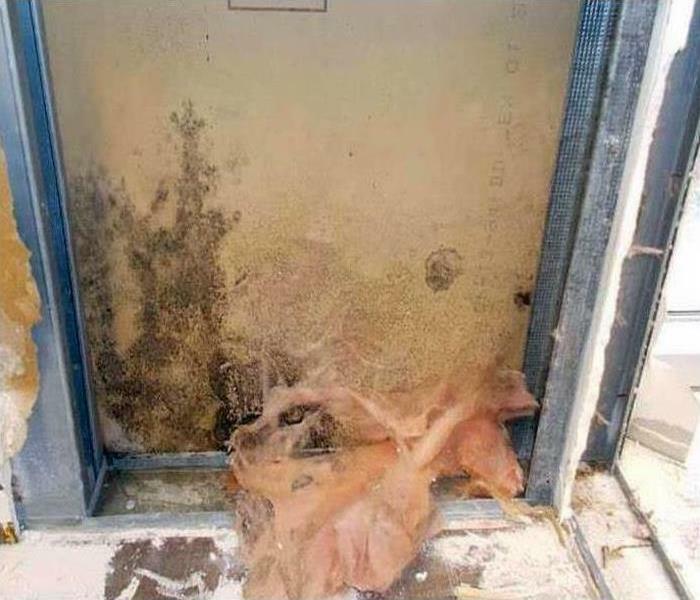 Commercial structures in Central Phoenix City can suffer from mold infestations. By calling SERVPRO, you can be assured that the problem gets eliminated rapidly, with minor disruptions as possible to your place of business. Special care is needed with the application of antifungal sprays and mildew retardant paints to keep the fungi out. 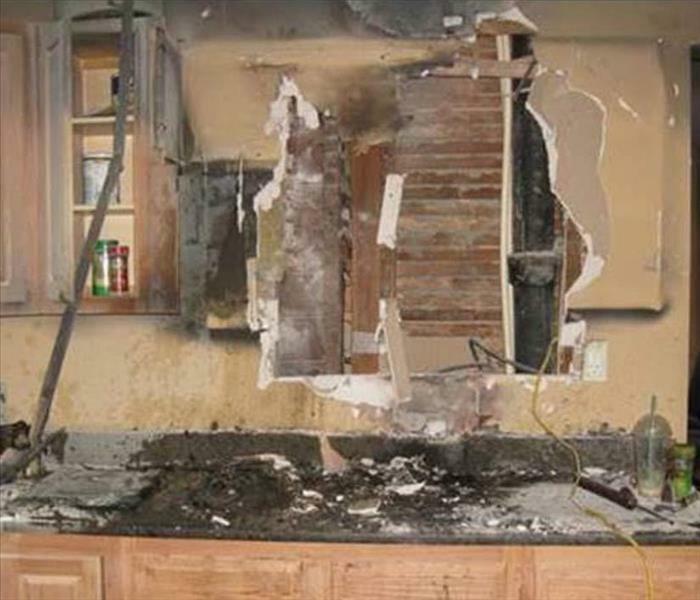 A fire in your kitchen can be disastrous. The team at SERVPRO are the best in the industry and are certified by the IICRC. SERVPRO of Central Phoenix has the specialized fire damage restoration training, certified personnel, and advanced equipment to handle any size disaster and can quickly restore your home to pre-fire condition. 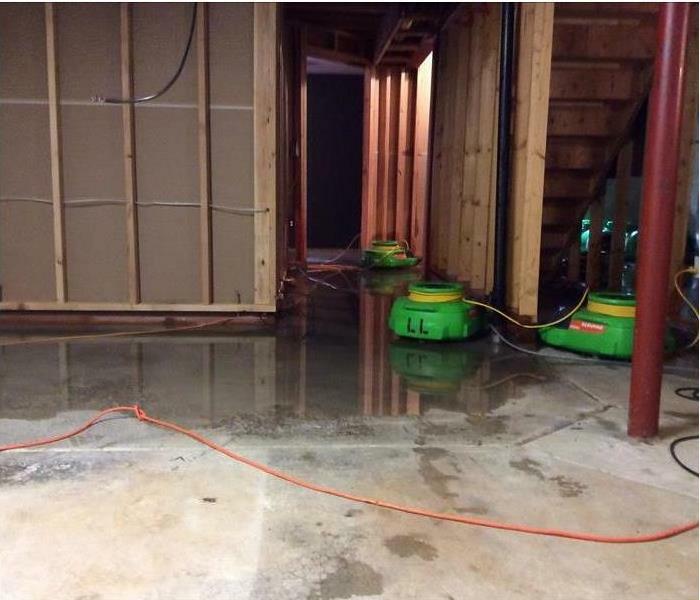 Even as water is being vacuumed out of this basement in Uptown Phoenix, SERVPRO can place devices also to extract water vapor. Most individuals are not aware that airborne moisture can also create a substantial storm and water damage problem. We can help. When leaking water starts to seep into the joints of a tongue and groove floor swift action is needed to salvage the planks. 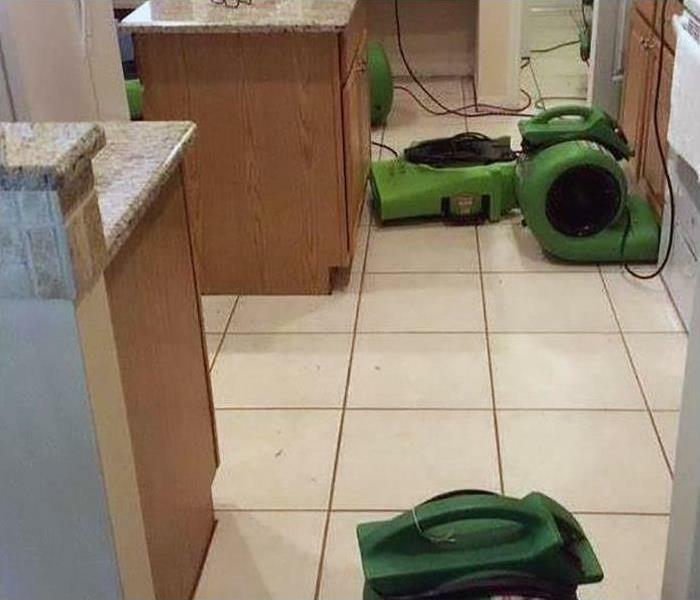 If SERVPRO is called out to a water damaging even in Phoenix, our technicians can utilize our arsenal of equipment, paired with expert experience, to mitigate the damages and salvage the flooring. Tenting and drying mats can save the day, just call us for help. 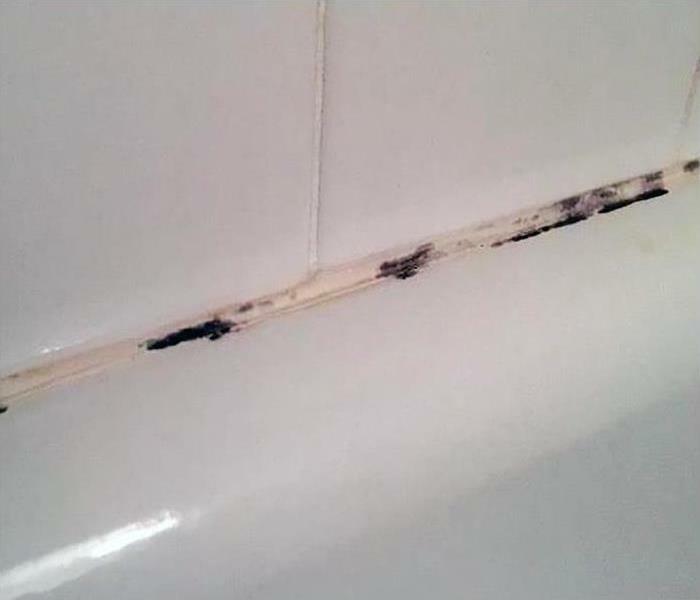 Mold grows when moisture is present, and the bathroom is the perfect place. Mold can grow within 48 hours, and even a minor infestation can grow out of control. 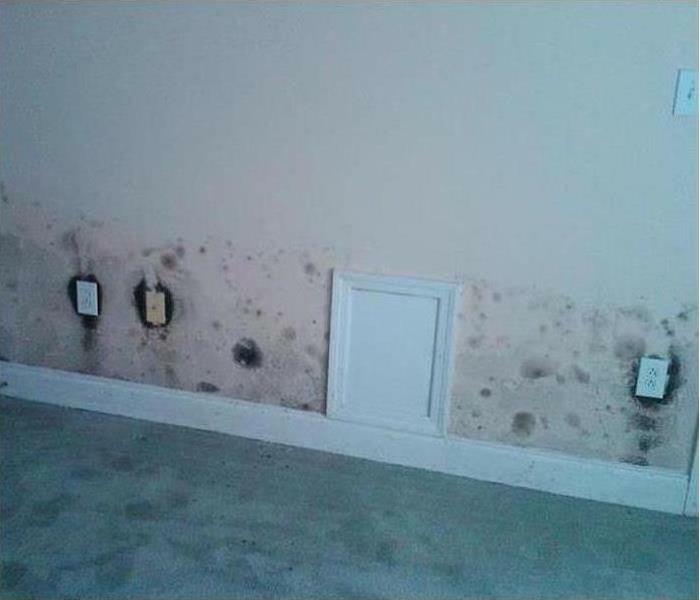 With the help of advanced mold remediation equipment, we will have your home restored to pre-damage condition quickly. SERVPRO of Central Phoenix is locally owned and operated, available 24/7, and Faster to Any Size Disaster! Warehouses, even in the Uptown Phoenix area, can suffer from a mold infestation requiring remediation. 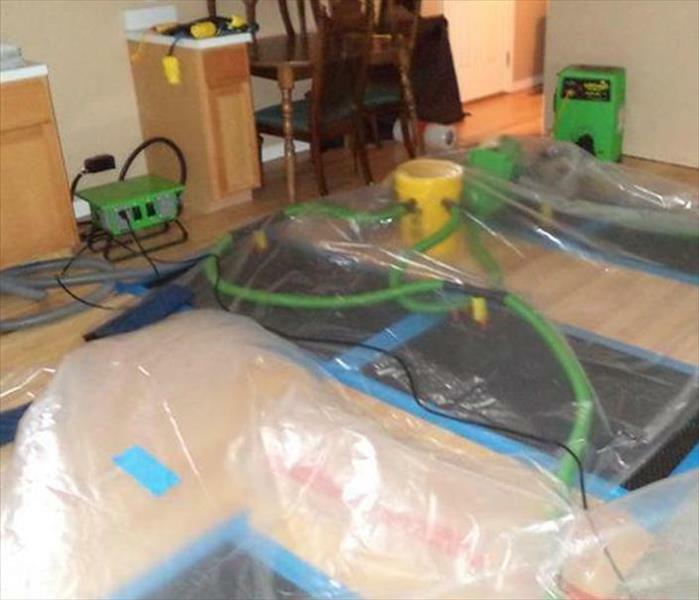 The process can successfully be completed by SERVPRO skilled applied microbial remediation technicians. Manufacturing and storage facilities must protect inventory and structure to maintain a viable operation. The pooling water can quickly damage engineered wood flooring, even in the dry climes of the Central City Phoenix area. 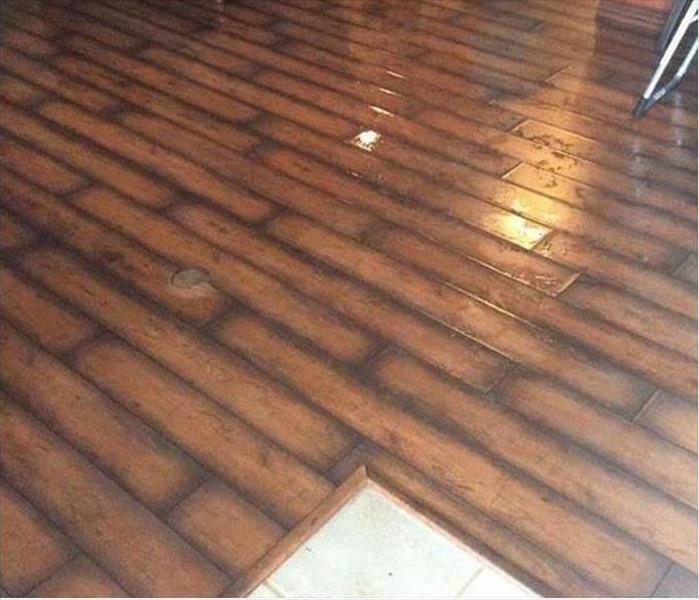 The sooner that SERVPRO is called upon to remove the liquid, the better chance of salvaging the planks and replace them. Strong rain-driven winds can blow a hole in the attic causing water and storm damage to properties in Central City Phoenix. 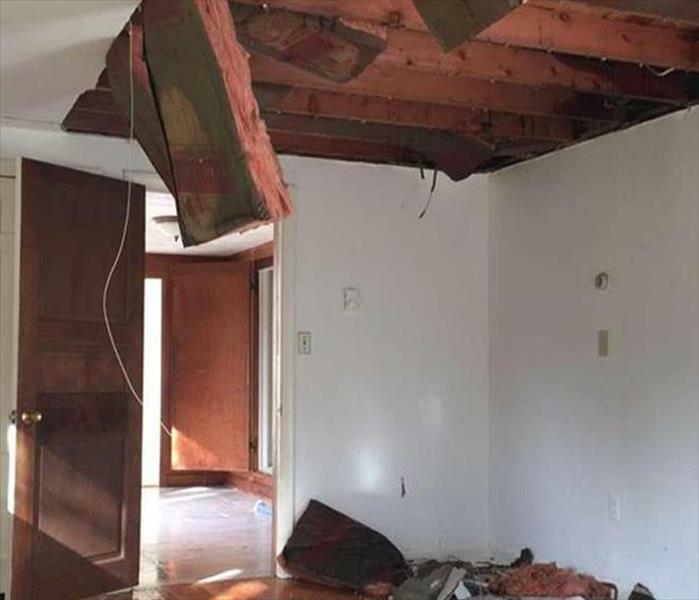 Cleaning up the debris, drying out the interior, and preparing the damaged areas for rebuilding is something that SERVPRO can do to help our clients. 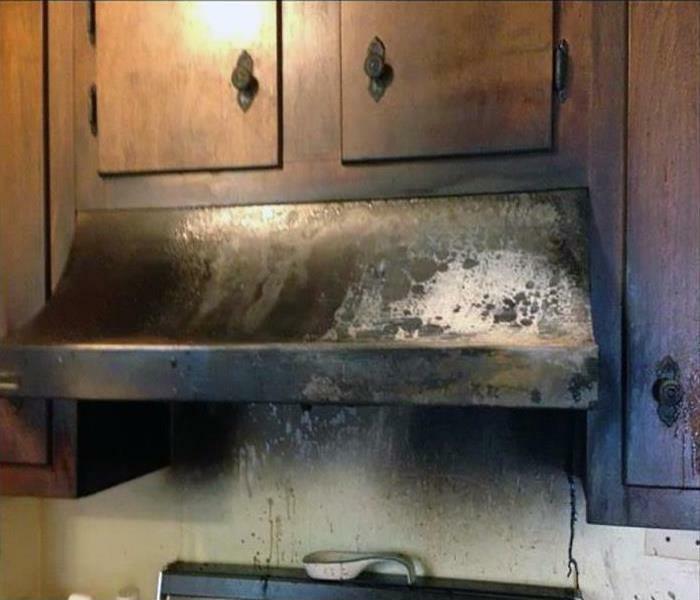 Kitchen fires are as common as the cold. Even in Central Phoenix and the surrounding areas. A good move is to call in SERVPRO to cleanup the charred debris and discard it safely and according to local and EPA codes. Then smoke and odor mitigation can begin. Commercial buildings in Central Phoenix can suffer from a ruptured water main leading to pooling water that disrupts work and threatens equipment and inventory. 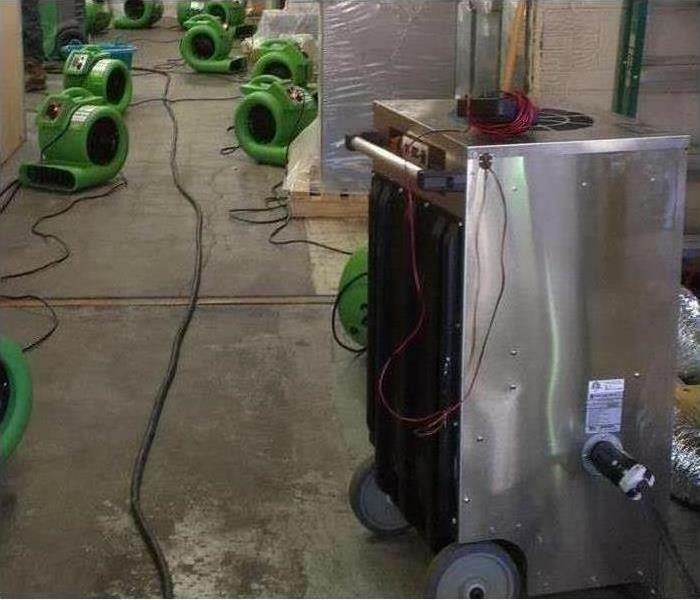 By calling SERVPRO, many companies profit from the expertise and equipment that can mitigate their losses promptly. Settle only for the best. 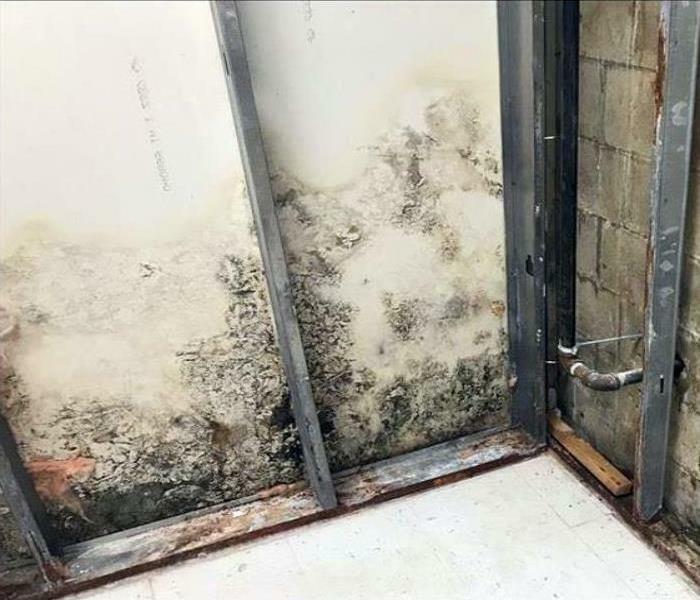 Mold damage in Phoenix requires top-notch professional attention along with the latest technology to assure a successful mold damage cleanup project. 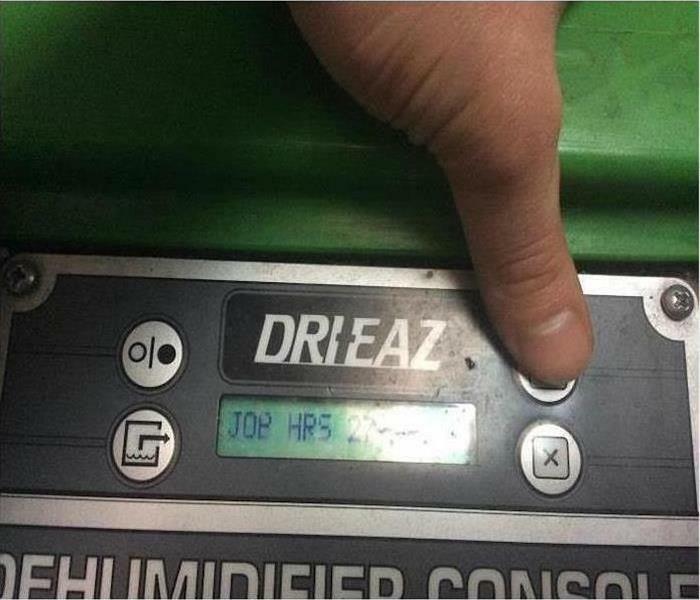 Shown is a state of the art dehumidification console which is typically used by SERVPRO for mold remediation. 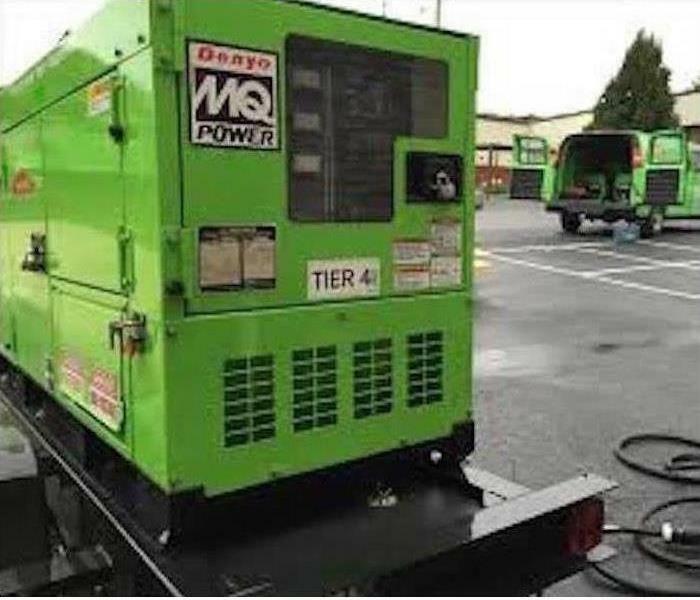 Storm damage in Phoenix occasionally shuts down power supplies creating the need for large portable generators to be used to supply the power needed for storm restoration services. SERVPRO of Central Phoenix is prepared if these conditions are present for your disaster. 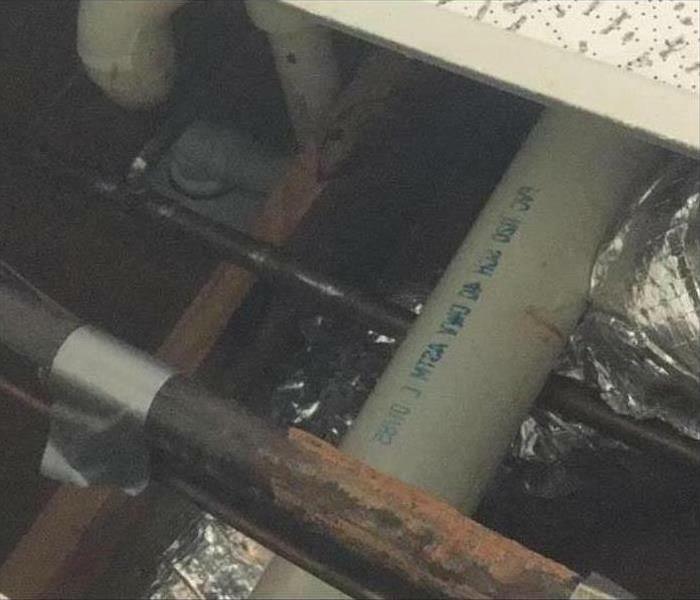 The supply line in this Phoenix attic sprung a leak. 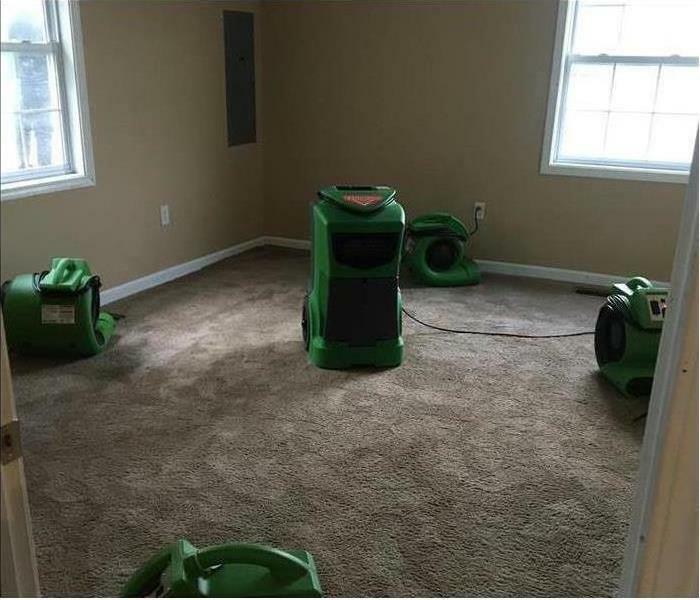 The damage was quickly dried by our SERVPRO technician with the use of directed air flow and a dehumidifier. He then sprayed an antifungal product to inhibit mold development. This structure in Central City Phoenix sustained a small fire in the attic and then water damage from the extinguishing. The cleanup and discarding of the fire and water damaged building elements was the first step in the restoration and replacement service. 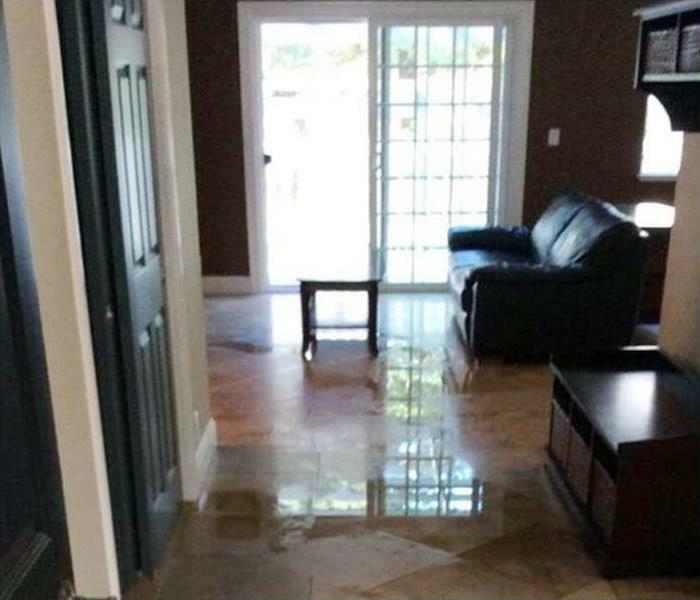 The tile floors survived the onslaught of water from the leak in this Phoenix business center. But the walls wicked water and the lower two feet were cut out and removed. By setting up lay flat ducting (tubes) our dehumidifiers and air movers quickly dried out the wall cavities to mitigate damage and costs. 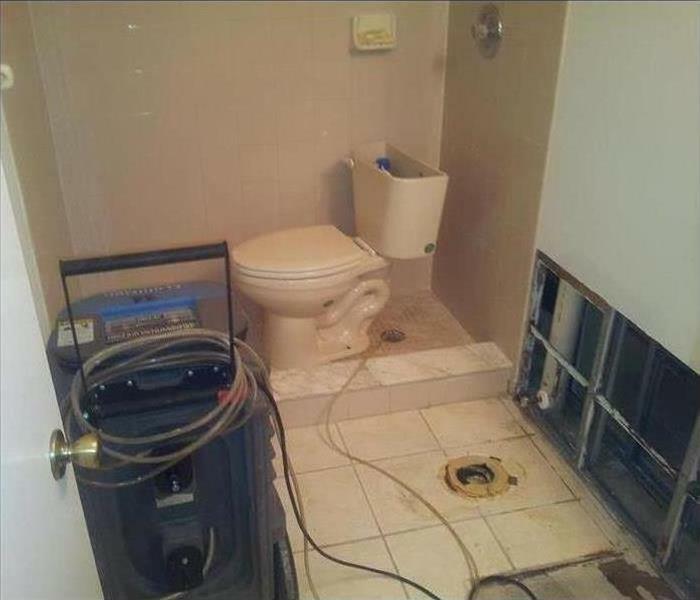 SERVPRO knows and practices the best techniques. 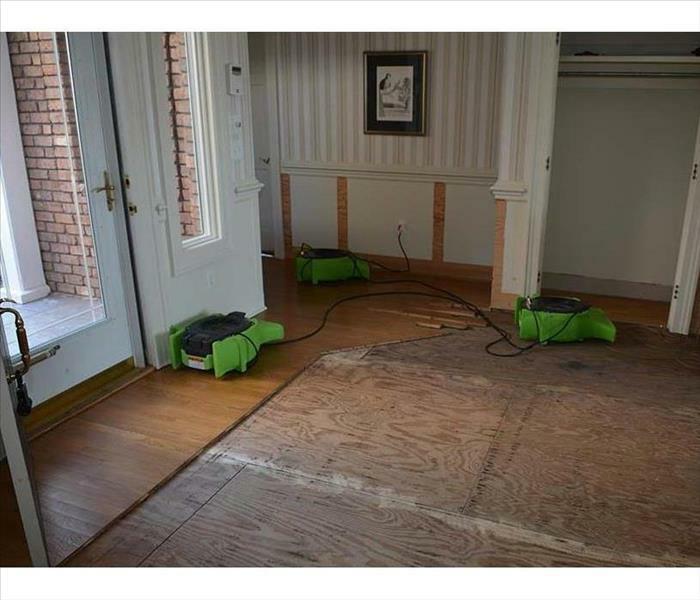 The green air movers and dehumidifier are busy at work remove the residual water vapor from the air and the plywood subflooring. The storm drenched the wood requiring our SERVPRO techs to cut out and remove some of the engineered planks that we non-salvageable and also to expedite the drying process. The small access panel leads to the plumbing of this Phoenix home's bathroom. The dripping provided moisture for dormant mold spores to grow into unsightly patches. Scraping the fungi, applying an antimold and mildew paint as a primer were the final steps taken by our SERVPRO technicians. Fire damage translates into heat damage when the nail heads and seams from drywall ceiling appear like this. This Central Phoenix City home can be restored with proper techniques once the smoke odors are removed with the help of an ozone generator which ran during the night when the home was vacant. Once the water was suctioned out of this wetted area of a Phoenix home, the drying process can continue. 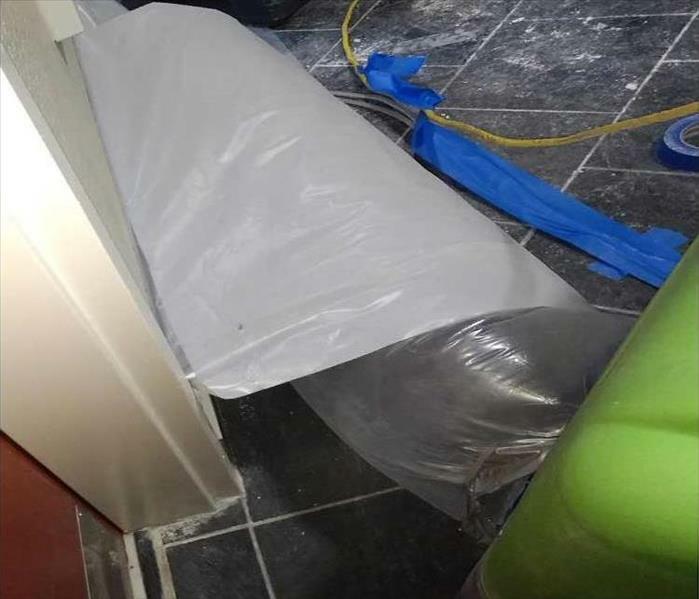 Protocols dictate setting up containment barriers, as shown by the poly sheeting, to increase the speed of evaporation and drying while also preventing the migration of moisture to cause secondary water damage. Get it done right, the first time!